Are you organising a festival, party or event? Are you member of an association and want to get your message across while raising funds? If that’s the case, then you need these printed using dye sublimation. Sublimation is the technique used to transfer a digital image on to the polyester using heat and pressure, meaning that they design will not come off of the fabric and stopping it from fading, making them more resistant and last longer. 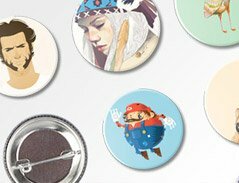 Also, we print them for you in full-colour high definition so that no detail gets lost in your design; they are made from a soft and comfortable material to prevent any rubbing on the skin. 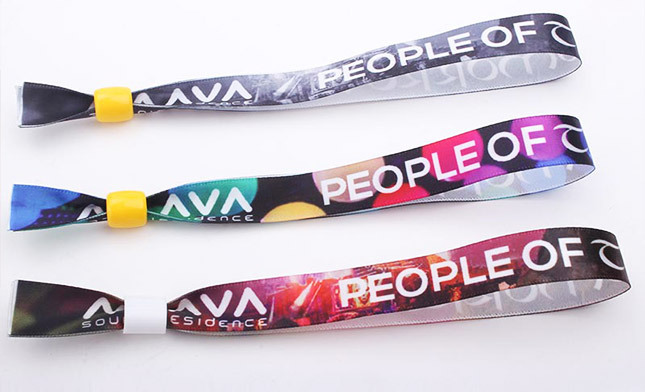 At Pinspop, we are experts in printing wristbands for festivals, wristbands for concerts, wristbands for parties, etc. etc. and any self-respecting event of this type needs these wristbands. A crucial element for guest or attendant access and to differentiate between the different attendance days or types of ticket. 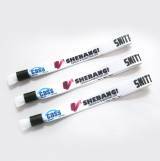 Print the word VIP on them, choose different colours or designs and help make the organisation of your event outstanding. What’s more, it is a nice souvenir for your guests to keep if you use an original and eye-catching design on them. Who doesn’t have a souvenir box with the wristbands from all the festival they’ve been to? 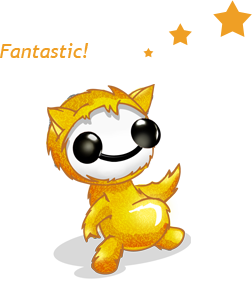 The fabric wristbands are also a fund-raising product for associations that can help you to promote your message. 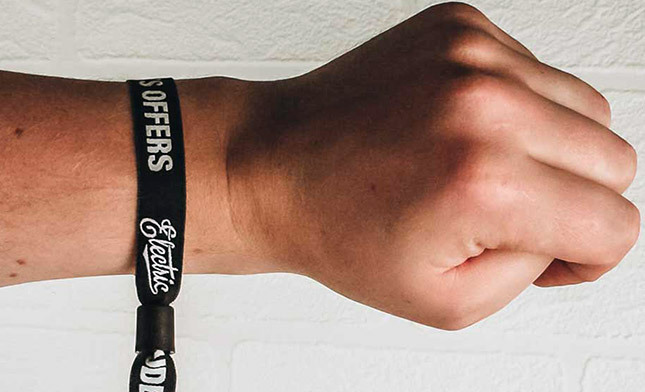 Charity wristbands that can help to get people on the street to collaborate with your cause. 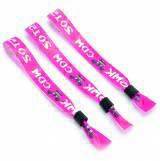 Cancer awareness wristbands, child protection wristbands, anti-gender violence wristbands, animal rights wristbands, etc. Whatever your cause is, you can spread your claim or message with these wristbands. You can choose between two different sizes according to what you are going to use them for or the design that you wish to include on them: 28x1.5cm or 35x1.5cm. What’s more, you can get them with matte or shine finishings. You choose! *The size of the bracelet is approximate. This size can be altered. *The ends of the bracelet are cut to the point. At Pinspop we offer different types of fastener so that you can chose the one that’s best-suited to your needs and goals. Secure fastener: The main aim of this fastener is to ensure that the guests at your event cannot take it off at any time, you can ensure that they only way to take this wristband off is by cutting the fabric. A must-have for festivals, parties and concerts. 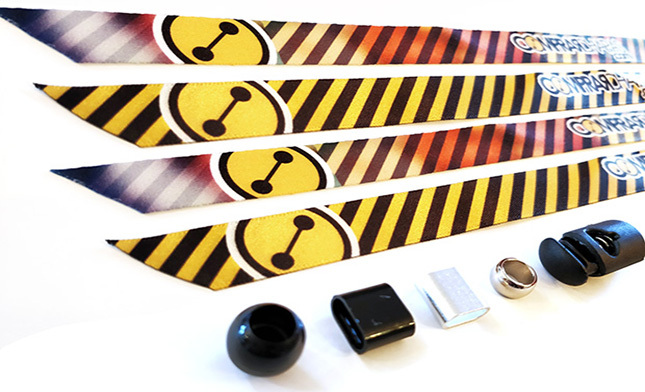 We have two types of secure fasteners for your fabric wristbands, with a plastic ring meaning you won’t need pliers to close them, and metal rings for which you will need pliers. 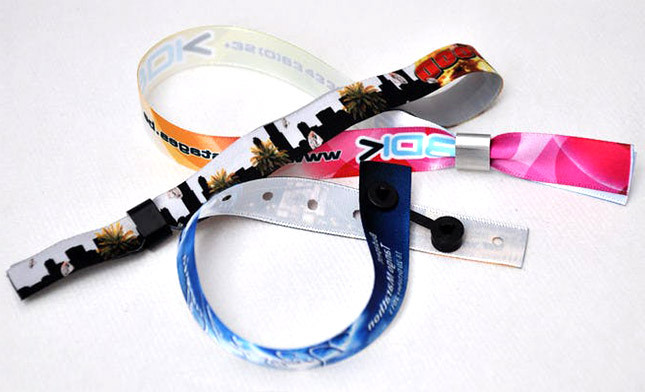 No fastener: If you don’t want any kind of fastener and just want the wristband, you also have that possibility. You just need to tie a bow or knot in your personalised wristband.